What is Purple Tiger Surge™ and why is it so effective? 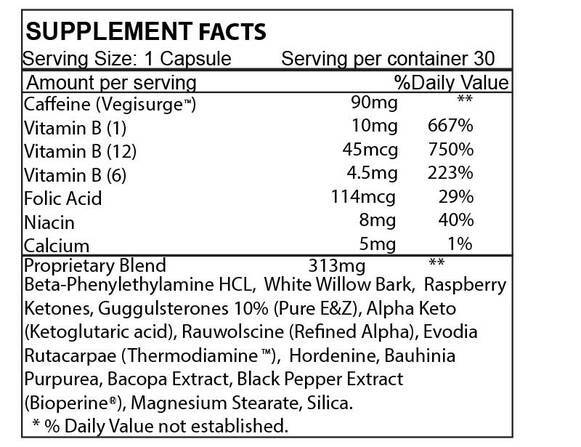 Purple Tiger Surge™ is a unique, fast acting, effective formula with ingredients that work synergistically together to increase energy, reduce appetite, decrease carbohydrate cravings, and jump start your metabolism. In less than an hour, you will quickly feel Purple Tiger Surge™ going to work through the proven ingredients that have been studied to decrease hunger signals, giving you a "full" sensation while allowing you to take control of your appetite, instead of your appetite taking control of you. Purple Tiger Surge™ begins to work quickly to increase your energy and metabolic rate while allowing your natural metabolism to stay in control. These powerful ingredients work through these mechanisms that are crucial to you losing weight quickly, safely, and effectively. Purple Tiger Surge™ a serious weight loss product... we're talking about rapid, significant weight loss and extreme energy, finally together in one power-packed super pill delivering more weight loss than the leading diet pill and all the energy you'll ever want or need... day or night. If you're finally ready to look great, feel great, and have energy to burn... Purple Tiger Surge™ is the one formula you need to experience. ﻿RECOMMENDED DOSAGE: Take 1 capsules with 10 oz. of water.